Black's video for "Friday" is one of those rare occurrences where even the most seasoned critics of Internet culture don't know where to begin. From the singing straight out of Auto-Tuned hell to lyrics such as "Tomorrow is Saturday / And Sunday comes afterwards / I don't want this weekend to end" and a hilariously bad rap about passing school buses, "Friday" is something that simply must be seen and heard to be fully appreciated. It’s official: Bad is the new good. While music tastes and styles have always been subjective, there’s no disputing that the buzz that built overnight around “Friday,” fledgling teen “singer” Rebecca Black’s ode to the weekend, is a sign that there’s no need to be good at what you do to draw attention. If you do it badly enough, that’ll do the trick. Were it not for Comedy Central’s “Tosh 2.0″ blog picking up on Rebecca’s mediocrity with the aptly titled blog post: “Songwriting Isn’t For Everyone” on March 11, most of us would’ve never come across her or her “talents.” That pivotal post set the wheels in motion, spurring Rebecca’s name to the top of Twitter’s trending topics for days. Of course, the fact that Rebecca’s video has gone viral doesn’t mean she’s destined for a Grammy anytime soon. This kind of “fame” is often short-lived as Rebecca is nothing more than a meme and a canvas for people’s sarcastic barbs and biting commentaries. We’ll all move on to the next awful thing in no time. But with over 9 million views on YouTube, countless covers and parodies and a write-up on RollingStone.com that calls her widely panned song “actually good,” Rebecca Black is winning Charlie Sheen-style. Rebecca Black: "Are you sure these are the lyrics you want me to sing?" Producer: "What are you talking about?" Rebecca Black: "This part where I just kinda slowly explain the ordering of the days of the week?" Producer: "That's the hook, baby! We breakin' it down for the kids! They gonna know those days!!" But there's something else going on here, something that makes "Friday" uniquely compelling. For one thing, Black's voice is totally bizarre... pinched and stilted... Obviously, this isn't the most pleasant sound in the world, but Black comes out sounding like a distinct singer with an alluring sort of anti-charisma. If the video was intended to be a parody of teen pop convention, it would be on par with some of the best SNL Digital Shorts by Lonely Island. 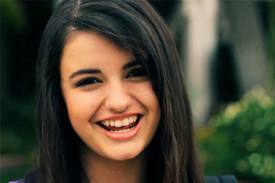 Rebecca Black's Bizarrely Bad Video for 'Friday': Is This For Real? This weekend the internet was mainly transfixed on the disaster in Japan, and rightly so. On a lighter note, there were those who were obsessed with South by Southwest. But amid all the real news, you might just have heard about the Internet's other weekend obsession: Rebecca Black and her hilariously dreadful video for "Friday". ...once you listen to the lyrics, you start to realize what a train wreck we're really dealing with. It's not apparent if "Friday" was intended to be a parody of a pop song or not (we doubt it, though we really hope it was), but it would definitely be in Rebecca and Ark Music Factory's best interest to make like it was all along. Okay, so just what is all the hubbub all about? Here's the YouTube video with the lyrics printed below. Judge for yourself if this is good or bad. And don't forget, she is only 13. Then again, the producer, ARK Music Factory are supposed to be professionals. They wrote the song, both the nusic and the lyrics. They made the video. Note: This is not the original video. The original one has now been removed but the last time I looked at it, it was well over 16 million hits. The number of articles referencing this story goes on and on. Salon quoted others as saying, "This is literally the worst thing I have ever heard." and "Is this the worse music video ever?" and they point out this video is merely the tip of the iceberg. Apparently there are more of these ARK Music Factory videos floating around on YouTube so if Rebecaa Black isn't enough, you can still get your fill. I sincerely hope that when my turn comes to step up to the plate, it will be for something of which I will later be proud and not something of which I will be ashamed. Ha! Pride or shame; heads or tails; it's just 15 minutes. I'm going to try and do my best when the moment comes but I have my fingers crossed that the moment will not consist of somebody with a camera inadvertently opening the bathroom door and catching me with my pants down. Gee, me with my pants down. Yup, just my luck that video goes viral. Rebecca Black's "Friday" performed by Stephen Colbert, Jimmy Fallon, and the Roots. "Friday" is a song written by Clarence Jey and Patrice Wilson, performed by Rebecca Black, a 13-year-old singer from Anaheim Hills, California. It was released as a single on iTunes on March 14, 2011. "Friday" was produced by the ARK Music Factory, a company owned by Jey and Wilson. Starting on Friday, March 11, 2011, the viewcount for the music video jumped from around 3,000 views to over 16 million on YouTube in a week and became a viral hit. The sudden increase in the viewcount was attributed to a Tosh.0 blog post titled "Songwriting Isn't for Everyone", posted on March 11. Since the growth in popularity of the song and video, there have been numerous parody videos and remixes. Forbes stated that the notoriety of the song is another sign of the power of social media — specifically Twitter, Facebook, and Tumblr, in this instance — in the ability to create "overnight sensations". Ark Music Factory is a company based in Hollywood which seeks to find young singers for promotion. Ark then writes music with (or for) these acts and records them, often producing music videos for them. According to the company's MySpace page, they categorize themselves as an indie record label. They state that their main objectives are to bring aspiring acts to the musical fore: "We at ARK make it possible for an emerging artist to be discovered, defined and delivered, to advance in their chosen career and be successful." Ark is predominantly based in the US, although they claim that artists they have supported have had success in different regions across the globe.